MIDI Wrench is your Swiss army knife that helps you coping with your daily MIDI setup tasks. Connect a MIDI keyboard, MIDI sound expander or any other MIDI device to your iPad, iPhone or iPod touch by using the Apple USB camera adapter or any other adapter supported by Apple.¹ Visualize MIDI messages sent by the connected MIDI device or send MIDI messages to the connected MIDI device. This is a simple but very helpful tool to spot problems in your MIDI setup or simply to analyze what kind of messages various MIDI devices are sending exactly. This app supports the JACK Audio Connection Kit for MIDI connections from/to other audio apps ! 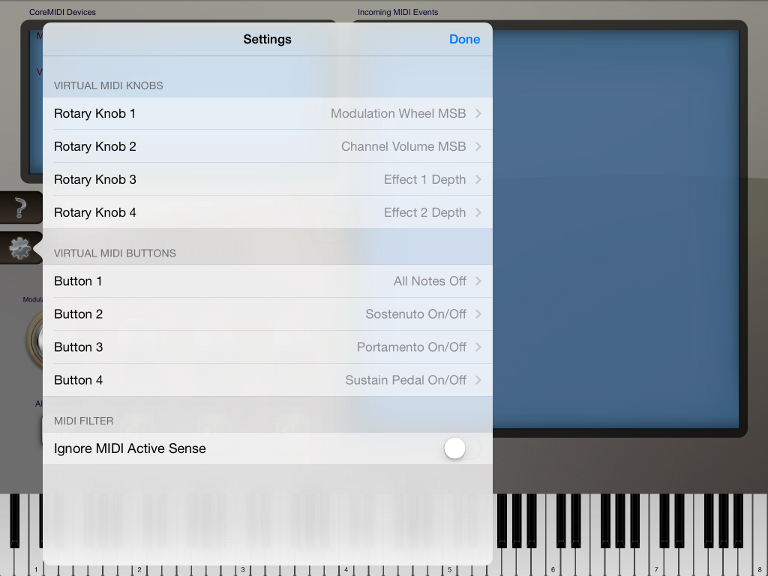 Lists all external MIDI devices attached to your iPad / iPhone / iPod touch. 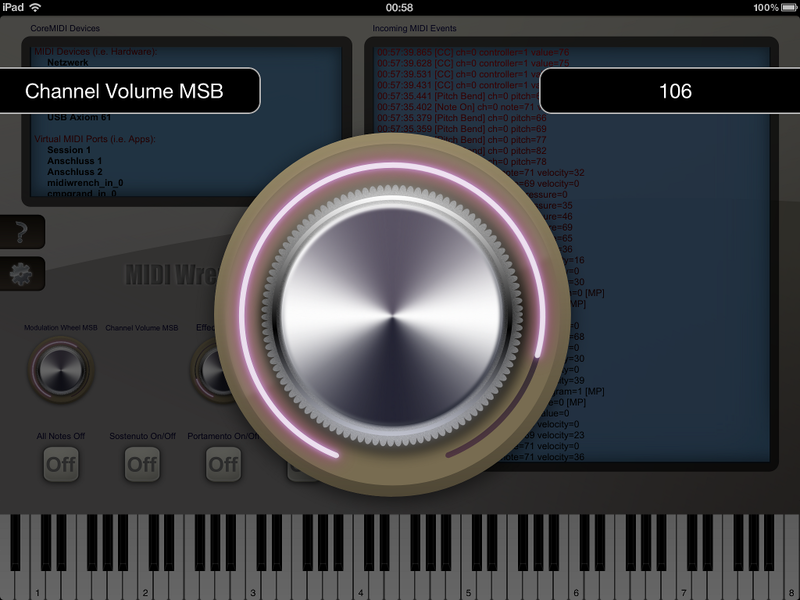 Lists all virtual MIDI ports provided by audio apps running on your iPad / iPhone / iPod touch. Displays MIDI events of all MIDI sources in real-time. Send MIDI Note-On, Note-Off and any kind of MIDI Control Change messages by using the virtual on-screen MIDI piano keyboard, on-screen rotary knobs and buttons. The virtual MIDI keyboard's keys, rotary knobs and buttons automatically update their visual state and values according to MIDI events sent by MIDI hardware and MIDI software ports. Configurable MIDI controllers and MIDI data filter. ¹ The adapter and / or the MIDI device you connect must be supported by the iPad / iPhone operating system in order to be able to use it with this app. You learn how to use MIDI Wrench within seconds. On the upper left side you have an overview of external MIDI hardware connected to your iPad / iPhone, as well as all software MIDI ports provided by audio apps which might be running on your iPad / iPhone. All MIDI devices and software ports which are currently available for use are shown in black, bold font, whereas disconnected MIDI devices and ports are shown in light gray color along to an "offline" marker. The latter can give you an indication that i.e. a certain MIDI device had been connected successfully before, but is currently not available anymore for some reason, i.e. due to some physical problem with a cable, connector or adapter. On the right hand side of the screen, MIDI data of all MIDI sources are automatically displayed in real-time, along with a time stamp and detailed informations about the respective MIDI event. In contrast to other MIDI monitor apps, this MIDI data list will never feel sluggish or even crash, even not under high load of MIDI data. You may scroll the MIDI data list conveniently with one finger and you may wipe the screen with one tap on the "C" button in the middle of the screen. Recent MIDI events are shown in dark red color, whereas older MIDI events are shown in black. This way you can intuitively distinguish them visually according to their occurance in time. On the bottom of the screen you have a full range piano keyboard (88 keys) that you can use to send notes to various external MIDI hardware, as well as to audio apps running on your iPad / iPhone / iPod touch. The keys of the on-screen piano keyboard are automatically lit up when MIDI note-on and note-off data occurs on some of the MIDI sources. Just above the on-screen piano keyboard, on the left side, you have virtual MIDI controllers in the form of rotary knobs and buttons. You can use them to simulate all kinds of MIDI controllers, i.e. for sending an "All Notes Off" message to stop hanging notes during a live performance, or to simulate a sustain pedal if you are somewhere on the road without a real sustain pedal around. The on-screen rotary knobs provide a very intuitive user experience. Instead of fiddling around with tiny knobs, the respective rotary knob automatically pops up enlarged on your screen when you tap on it, animated with the rotary knob's precise purpose and its current controller value in a large font. No need to search for your glasses or to challenge your motoric skills. The virtual MIDI controllers of MIDI Wrench are fully configurable. So you may assign arbitrary MIDI controller numbers to each one of the on-screen rotary knobs and buttons. You may also filter out frequent, disturbing messages like the MIDI Active Sense message which is sent by many MIDI keyboards to inform the receiving side that it is still connected and alive. All your settings will automatically be restored next time you launch MIDI Wrench. We recommend you to use Apple's Camera Connection Kit as an adapter between your iPad / iPhone / iPod touch and USB. This virtually allows you to connect almost all MIDI devices with an USB connector. All our apps however are also compatible with numerous other third party accessories. MIDI Wrench is currently available for the following mobile phones and tablet devices. In case you encounter any problems while using this app, please report it to us by using the feedback link above. 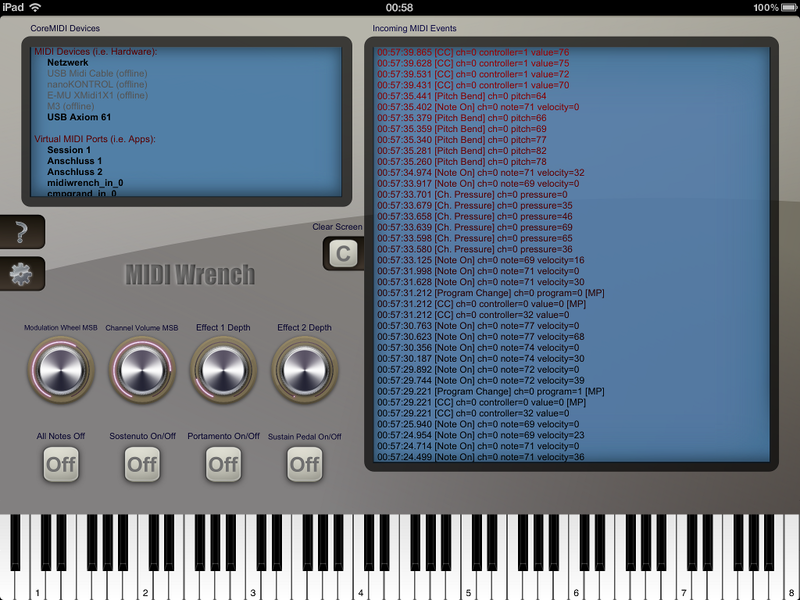 You can get MIDI Wrench through iTunes from the Apple App Store. Note that you need at least iOS 4.2 or later to be able to use this app. Your device is not supported yet? Don't hesitate to write us by using the feedback link above.